WASHINGTON, July 30, 2012 – Officials from the Defense Department and the U.S. Geological Survey gathered this month at Afghanistan’s U.S. Embassy to unveil what the director of a DOD task force called a “treasure map” of the nation’s mineral resources. At the event, James Bullion of the Defense Department’s Task Force for Business and Stability Operations, or TFBSO, shared the podium with USGS Director Marcia McNutt, who described a new remote-sensing technology that has made it possible, for the first time, she said, to map more than 70 percent of the country’s surface and identify potential high-value deposits of copper, gold, iron, and other minerals. DOD officials and USGS scientists work as partners in this initiative with the Afghanistan government and scientists and engineers from the Afghan Ministry of Mines and the Afghan Geological Survey. “The task force is a Defense Department organization charged to help spur and grow the private-sector economy in Afghanistan, … and clearly, the mineral and oil and gas extractive areas are critical to that effort,” Bullion said. In reading through the whole article, maybe it's not so new. Just under reported. Should international economic development really be a mission of the DOD? Seems to me this only hands a propaganda bonanza to our enemies who consistently claim U.S. military adventurism is primarily a function of grabbing wealth and resources. Something else gives me a chill about the concepts presented here. We're using U.S. defense (and other government) funding to help Afghans exploit their natural resources while, at the same time, our government makes it increasingly harder for American industry to get access to our own natural resources here at home. Our government is moving in some very odd directions. The gun ban crowd seeks an end run on the issue. A bill to drastically limit Internet ammo sales is set to be be introduced in Congress this week. Sponsors say the move will stop potential criminals from obtaining huge arsenals of ammunition. How huge are those so-called arsenals? 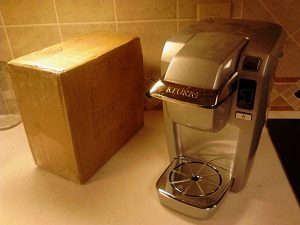 Here's what a box like those used to ship a thousand rounds of .223 rifle ammo looks like against a baby Keurig coffee maker. Pistol calibers take up a lot less space. Yes, people involved in shooting sports often order a thousand rounds at a time. Sometimes they buy a lot more. But a family of four can easily shoot through a thousand rounds in an afternoon at a gun range. Urban and suburban shooters often travel significant distances to get access to an outdoor rifle range. When they get there, they want to make the trip worthwhile. Shipping rate cards also make it more practical to buy in larger lots. And shooters stock up when they find good buys online. Want some other reasons online ammo sales make sense? Gun control advocates insist waiting periods save lives. Ammo sold online can take a week or more to arrive. Even orders shipped overnight (at punishing additional expense) likely take at least 24 hours to arrive. This compares to ammo sales in retail stores where you walk in, walk out in a matter of minutes. Online ammo creates a paper trail to the buyer. Credit card orders and shipping manifests are part of the chain. Sellers often require a copy of a driver's license before accepting an online ammo order. Some also require an adult signature before the shipper (FedEx or UPS) can leave the package. This compares with walking into a store, paying cash, and walking out with no recorded customer disclosure. Ammunition is not shipped by U.S. Mail. Retail stores stock only a fraction of the ammo makes and types available. Online ammo sales allow shooters to shop a variety of calibers, loads and manufacturers. The right ammo for the right use increases shooting safety. Those seeking to ban online ammunition sales point to the Aurora gunman who reportedly acquired 6,000 rounds of ammunition prior to his attack on the theater. But is there any significance in his use of the Internet or the number of rounds he acquired? No way anywhere near that much ammunition was used in the attack. If no red flags prevented his legal acquisition of arms (or his being picked for an exceptional $26,000 federal science study grant), there's likely nothing that would have triggered a halt to his ammo purchases - whether they were done in-person or made online. Online ammo sales are simply being scapegoated by gun control advocates who see opportunity to exploit emotions as well as the ignorance of the non-shooting public. It's a game they've played many times before. It's probably not coincidence they revealed their proposed legislation on the same day criminal charges were announced in the Aurora shooting case. Do we travel a road long ago predicted? "What resistance could be made? The attempt would be madness. 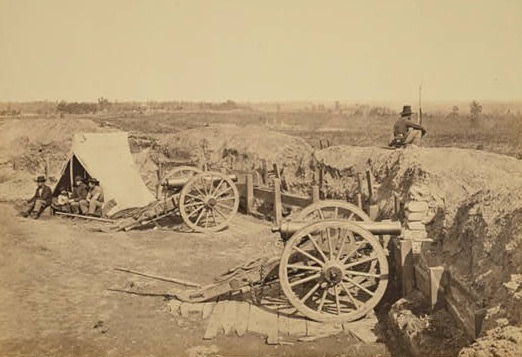 You will find all the strength of this country in the hands of your enemies; their garrisons will naturally be the strongest places in the country." The difference between Miller and Henry is that Miller seems to embrace the concept of superior government force. In 2007, he was among cosponsors in an attempt reauthorize a national assault weapons ban, a move that would presumably tipped the scales ever farther in government's favor in terms of monopoly of force. Pat Henry, on the other hand, referred to people who back such moves as the nation's enemies who lead us down the road to "absolute despotism." In 1788, Mr. Henry had a question regarding the end to such a journey. It still deserves consideration today. "What will then become of you and your rights?" As for Congressman Miller, his time in Congress is coming to an end. Last year's legislative redistricting put him in a district with another long-time Democrat, and Miller chose not to see reelection. Have you read the original Baptist Press story with comments from Chik-fil-A's Dan Cathy? If not, I link to it here. And I found this story from 2008 to be just as revealing, perhaps more so, regarding the kind of people who are behind the Chik-fil-A story. Stealth and concealment are key survival tactics. Here's a story about a kid who used them. And he's a fast thinker too. 10-year-old stays calm as thieves invade Lawrenceville home. The feds are looking for something. Seattle police too. Apparently authorities in the Northwest are taking some of last May's May Day antics a bit more serious than some first thought. 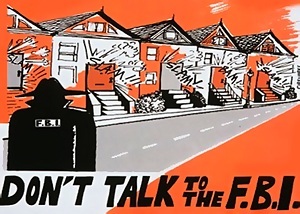 Several homes were raided by the FBI in Portland, Oregon earlier this week. And subpoenas seeking testimony before a federal grand jury were reportedly handed out in Seattle and Olympia, Washington as well. Occupy Wall Street and other activist groups are urging resistance to the federal probe. 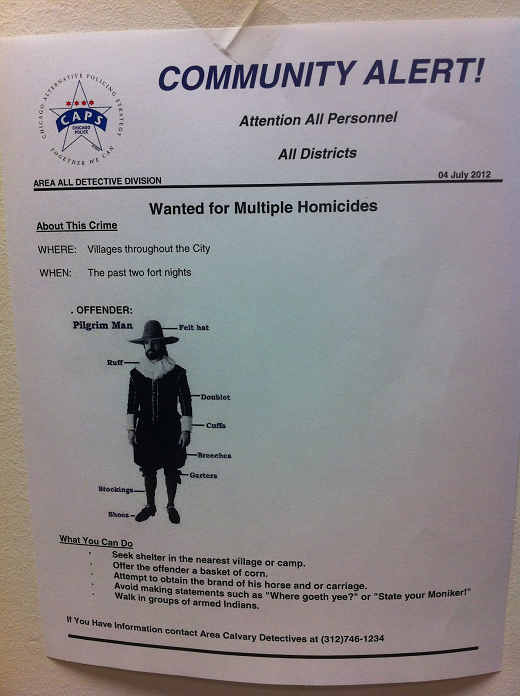 Occupy's resurrected an old poster that first received notoriety when CAIR posted it in California about a year and a half ago. It carries a direct message: "Don't talk to the FBI." Meanwhile, Seattle police reportedly carried out a raid earlier this month on an apartment where members of Occupy lived. That raid was also reported as being tied to investigation of May Day activities. Some shots here I'd not seen before. Photos of in and around Atlanta during the Civil War. As they were all credited to the same photographer, they appear to date from the time around Sherman's capture and occupation of the city. 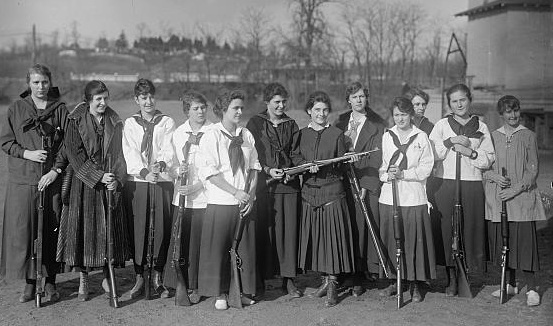 We've had lots of reaction to last week's post showing young women who participated in the rifle team at Washington DC's Western High School in 1916. There are plenty of other photos that chronicle women's shooting sports, and civilians drilling with firearms in the nation's capital. Could you imagine the fits the National Park Service and other agencies in Washington DC would have over a photo shoot like this today? 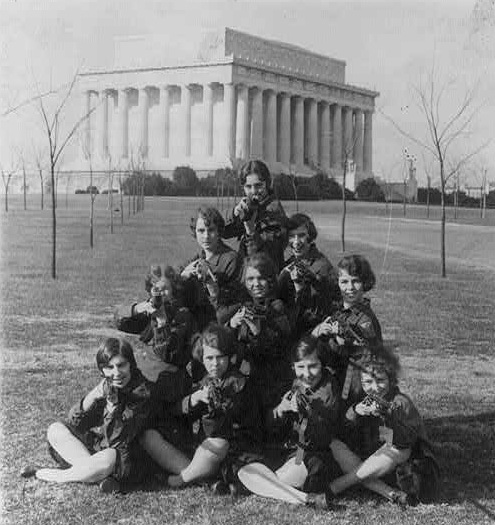 In 1927, it appears the Women's Rifle Team from George Washington University had no trouble having its picture taken near the Lincoln Memorial. And they did it bearing arms. These young women could not only shoot, but apparently went through physical training drills with their rifles. Guns, activities involving them, and the spirit of camaraderie they bring were seen as positive experiences in the 1920s. 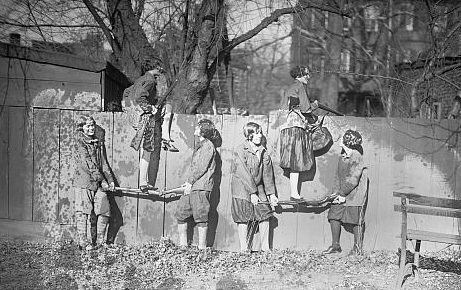 And this 1925 shot of the GWU women offers another glimpse of physical activity with rifles. Guns are not only good for shooting, but in a team setting, can be used to scale walls and other obstacles. It's hard to imagine such drills taking place on most campuses today. Historical photos like these go a long way in dispelling myths that shooting was only a guy's sport in the past, or that it was popular only in rural areas. They also show women's marksmanship was among the more celebrated extracurricular activities in academic settings. 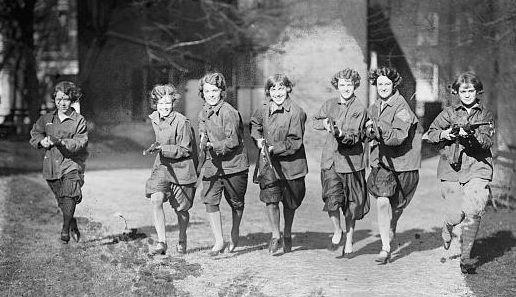 Thanks in part to photographic evidence, we know shooting sports were among the first organised school athletic activities for young women. These teams seem to have been especially well documented in the nation's capital, and seemed especially popular around the time women's suffrage became a reality. Chances are at least some of the women participating in shooting sports also considered themselves progressives. And I've yet to find a press clipping or any other indication the guns or the people involved in these activities were ever involved in misuse of a firearm. Day by Day Cartoon cartoonist Chris Muir's latest series. Saturday's strip reveals Obama's Ghost of Christmas Future! The current round of negotiations failed to produce an arms trade treaty. But a major proponent of the treaty is quoted as saying he expects some kind of agreement to be reached before the year is over. And on Twitter, I saw someone calling for a deal in October. I suppose this means not much chance any time soon of Obama's major gun control address Chris Matthews promised was coming back in January 2011 <wink>. And David Codrea at Examiner.com sees the Obama team's gun control efforts going back into a more stealthy mode. Any chance the prez regrets this week's gun control self-disclosure? It looks like the United Nations team working on the Arms Trade Treaty may work into the night in efforts to iron out a deal that many advocates for the U/S. Second Amendment are dreading. Meanwhile, President Obama stepped forward and indicated he and his administration would pursue a direction toward more gun control when he spoke to the National Urban League earlier this week. Are we finally on the verge of getting the major Obama gun control address that so many on the left were sure was coming back in early 2011? Democrats appear pretty darned determined to find a back door to grab high-cap mags. Wanna bet this only ramps up mag sales? Are there even any guns, mags or ammo left on store shelves? I may have to go take a peek tomorrow. If not tomorrow, Saturday. We'll update Chicago's and Boston's war on Chik-fil-A, and the bigger message they're trying to send. Obama comes out of the closet on gun control. The UN arms treaty is supposed to be out as well. And Obama's USDA came out against eating meat on Mondays... until it said it didn't. There's plenty more we'll get to on Friday's show. One o'clock Eastern on TalkSouthRadio.com. Florida's about to hit a million concealed carry permits. "My upcoming birthday next week could be the last one I celebrate as President of the United States, but that's not up to me -- it's up to you." Okay America, the ball's in our court. Okay. Stephen Colbert uses the scorching heat and drought conditions facing farmers in the heartland to make for some funny lines now. But who among us will be laughing when they see what happens to food prices in the coming months? Is there anything you could be buying now and storing to help offset anticipated price hikes? Or how about shifting household budgets around now to steer more resources toward food acquisition to deal with those anticipated price hikes? So, Chicago Mayor Rahm Emanuel wants to ban Chik-fil-A restaurants from the Windy City because company president Dan Cathy believes marriage should be kept as something between a man and a woman. Yet Rahm and other Chicago officials simultaneously welcome Louis Farrakhan to send Nation of Islam patrols into Chicago neighborhoods in an attempt to curb street violence. 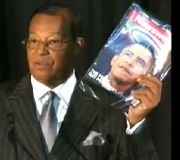 I'm pretty sure Rahm and the rest of his cabal know where Farrakhan stands on gay marriage. If not, this portion of an NOI video should fill them in. When it comes to Rahm Emanuel's Chicago values, hypocrisy appears to be first and foremost. Does he even realize what he said? How many American gun owners would be stupid enough to think like the president says they do? Which AK-equipped battlefield of war is Obama talking about? Which AK-equipped battlefield of war wins applause at this Urban League gathering? If the U.S. is involved in a combat situation, soldiers and other combatants on battlefields with AKs generally have them pointed at our troops. AMERICAN FORCES DON'T USE AKs. But the Taliban, the Russians, the Chinese, al Qaeda and a bunch of others do. As did Saddam's Republican Guard. How many American lives have been lost to AK-47 fire in Iraq and Afghanistan? How about Vietnam? The number of Americans killed or wounded with AKs on battlefields of war massively exceed any AK casualty count here at home. Mr. Obama seems to think that's cool. So did his audience last night. Other steps to reduce violence have been met with opposition in Congress. This has been true for some time -- particularly when it touches on the issues of guns. And I, like most Americans, believe that the Second Amendment guarantees an individual the right to bear arms. And we recognize the traditions of gun ownership that passed on from generation to generation -– that hunting and shooting are part of a cherished national heritage. What kind of so-called common sense steps would the president propose to keep arms out of the hands of a guy like grad student James Holmes in Aurora? On paper, the guy was squeaky clean. The National Institutes of Health deemed him sane enough and brilliant enough to award him a $26,000 grant to study neuroscience. Yet some clerk working a gun counter is supposed to spot a guy like Holmes as potential trouble and stop the sale? No, Mr. Obama isn't speaking incremental or case-by-case trip wires to stop a sale. Mr. Obama seems pretty clear, his agenda is to ban guns he deems inappropriate in our society. The only thing he hasn't done is tell us exactly how deep his list of forbidden arms would go, or the specific strategy he plans to use to make it happen when he and his team believe they see an opportune moment. In Virginia, dogs and cats are getting prepared forms encouraging them to register to vote. WAVY TV in Norfolk says a dead dog was also sent one of the invites. The Romney campaign in Virginia is now asking the state's attorney general to investigate. Our Chessie will be checking the mail. But even if the dubious campaign comes to Georgia, I doubt he'd get one. We live in a zip code that's notorious for voting Republican. Can you trust officials who won't stand behind own up to what they say? Can you trust a media that submits to censorship? No right wing spin here. The New York Times is the one reporting that's exactly what we're dealing with. Of the two, which was the bigger factor prompting gun buyers last weekend? Fear of becoming a shooting victim prompted by what happened in Aurora, Colorado, or the knee-jerk calls for more gun control by the media and Mayor Bloomberg that followed? Regardless of which one dominated, together they delivered quite a surge. The Associated Press reports gun sales were up 43 percent over the previous weekend. There are two ads out there regarding President Obama's words concerning small business success and who gets credit for it. The first comes from the GOP and employs Mr. Obama's original comments. The other, damage control from the Obama campaign, rewrites the president's message. Which Obama talk strikes you has more authentically representing his core beliefs? The one with enthusiastic supporters cheering him on, or the one where he plays exclusively to the camera and says he's been taken out context? I don't understand why police officers across this country don't stand up, collectively, and say, 'We're going to go on strike. We're not going to protect you unless you, the public, through your legislature, do what's required to keep us safe." Think about what he just said. Bloomberg expresses no problem with the chaos and turmoil that would result during such a strike. He has no compassion for victims of crime. He just wants our guns taken away, and is willing to sacrifice you to do it. With guys like Bloomberg running the show, there's no way you can trust the state to keep your or loved ones safe. He'd trade your security to meet a political objective. He just told you so in his own words. Do you trust him? If police ever do disappear from the streets, are you going to be better off without a gun? Or better off with one? The gun control crowd will tell you guns in urban public schools are sure to lead to carnage and mayhem. Here's a high school shooting team from Western High School, Washington DC. The year was 1916. Mary Jayne seated in rocking chair with pistol strapped to her knee, claiming exemption from concealed weapon regulation by saying her thirty-two isn't a concealed weapon in these days of knee-length skirts. Wish I knew more of the history here. My assumption is she was trying to skirt an early concealed carry prohibition. 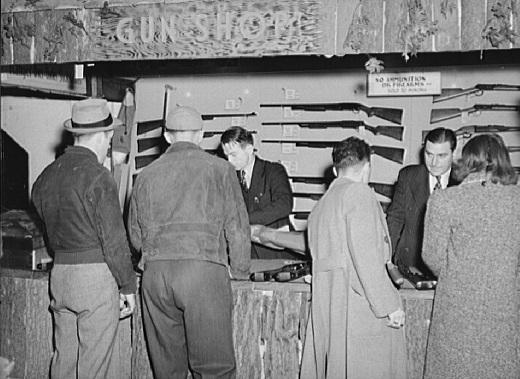 Crowds at the gun counter aren't just a recent phenomenon. Americans have always had a keen interest in firearms. 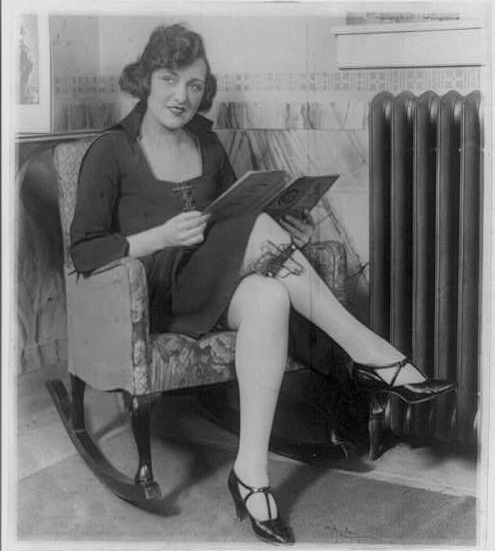 Dated October 1941, this photo is part of the U.S. Farm Security Administration/Office of War Information collection at the Library of Congress. Tunnel vision... or something else? I can't tell you how many news stories I've read or TV reports I've seen since Friday that express shock and dismay that the killer in Aurora, Colorado was able to hatch a plot and in a matter of months acquire guns, ammo, tactical gear and bomb making materials to carry it out. The result: A dozen people dead and nearly a sixty others injured. The killler's acquistion of guns and ammo have especially been targeted.. But have any of those who express shock and vent rage at the availability of firearms ever considered the horrors that have been fueled by something as simple as a can or two of gasoline? Anger followed by a knee-jerk acquisition of a dollar's worth of gas set the stage for arson that killed 87 people at the Happy Land Social Club in NYC in 1990. 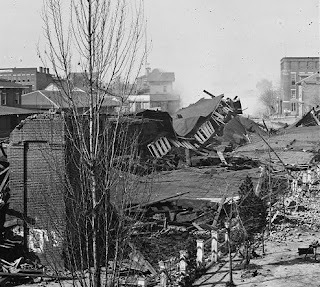 Atlanta's Winecoff Hotel fire, America's deadliest, claimed 119 lives in 1946 and was initially thought to be accidental. Subsequent investigation has led many to believe it was arson likely fueled by gasoline. More recently, a guy in Cleveland, Ohio used gasoline to kill nine including eight kids having a sleep over. Twenty-nine were left dead after a little gasoline and a flame were applied to a hotel in Pima, AZ in 1970. 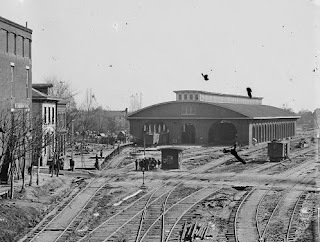 In South Korea, a twisted and depressed man used gasoline (or paint thinner) to kill himself and 198 others in a subway station in 2003. A five gallon can of gas contains far more deadly potential than what was delivered by those firearms in Aurora last week. And the Aurora killer had bomb-making know-how. There seems to have been huge potential for things to have been far more deadly if the Batman theater killer hadn't been obsessed with guns, and instead used bombs or arson to make his primary strike. Booby-traps in his apartment made use of various components including a reported ten gallons of gasoline. The guy had the means to potentially kill hundreds in a matter of seconds. But he chose guns including a rifle with a defective magazine to carry out his first strike. There's a history of mass killings done with gasoline or similar accelerants that have delivered body counts dwarfing the worst of those carried out with firearms. But I've yet to hear a single gun control advocate ever express upset about the destructive abuse of gasoline or speak out for restricting access. The gun control crowd must suffer from tunnel vision. Or, more likely, these activists have a bigger political agenda when they exploit heinous crimes and crimes' victims in their campaigns that specifically target guns. After three days of mass shooting saturation by the US media, Monday morning rolls around with the grim reminder the rest the world continues falling apart. The financial stuff has far more impact on far more Americans than the large but isolated shooting does. But how many eyes gloss over when you try to tell most Americans of the larger danger that's playing out in what should be clear view? Carney seems pretty clear the president doesn't plan to go through Congress for any new gun control. But there's plenty in this statement to suggest the president remains open to doing end-runs by using regulatory means. The Obama team's bypassed Congress before. It involved us in an air war over Libya. And it got creative in efforts to legalize illegal aliens when Congress didn't come through the way it wanted. Gun control may well be the next biggie to get the go-it-alone treatment. The probability would likely grow significantly if Mr. Obama wins a second term. And if recent speculation about UN arms treaty talks is accurate, Mr. Obama could couch a bunch of new rules and regs as simply complying with international priorities to make the whole world a safer place. Of course, he'd have to insist whatever he does doesn't infringe on the Constitution's Second Amendment. But remember, he's also the same president who still insists the Obamacare penalty isn't a tax. 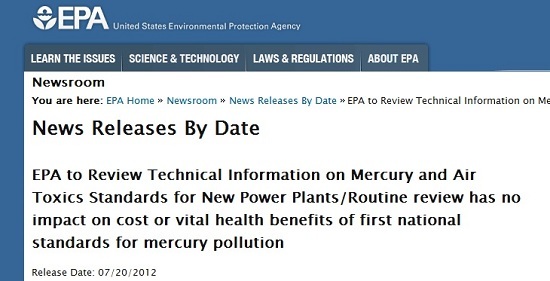 Interpretation: The Obama administration may be open to revising or clarifying some of the new standards it seeks to impose on new coal-fired electric plants. The proposed regs are in addition to those already being used to force utility operators to abandon many older coal plants, and to do so often many years ahead of previous schedules with no immediate means to replace lost generation capacity. I'm not seeing a major policy shift, and maybe not even a little one. Looks more like the Obama team simply wants to appear more open-minded, and thereby negate some of the political baggage the rule-making carries until after the November elections. Remember what Mr. Obama previously told the Russians? "This is my last election ... After my election I have more flexibility." Treaties can be signed by an American president and his representatives, but that doesn't necessarily mean the treaty will be immediately submitted to the Senate for ratification. In the interim, a president may have the power to begin moving toward treaty compliance under his executive authority. For a scholarly treatment of the ins-and-outs of ratification issues and options, check out Unratified Treaties, Domestic Politics, and the U.S. Constitution by Duke law professor Curtis A. Bradley. What are the chances President Obama will sign the soon-to-be-finished UN Arms Trade Treaty and choose to move toward compliance by executive order and agency regulation? And if Mr. Obama chooses a non-ratification route, would his administration gradually phase in new regulations and other restrictions (perhaps so they don't seem so severe initially)? Or would the O-team go for giving us the full monty from the git-go? Stay tuned folks. This picture may become more clear in the coming weeks. Let me say right up front, I'm not a fan of 'gun free' zones. And I'm a proponent of lawful concealed carry. There have been many times where the presence of an armed civilian has saved lives. But those who seemingly express opinions that an armed civilian could have readily cut down or disabled the Aurora theater shooter are probably dreaming. From what we've been told, the shooter was wearing body armor, and was armed with an AR-15 and other police-grade weapons. How effective would the average conceal carry pistol be against combat Kevlar? Consider the North Hollywood shootout: Two guys in body armor with AKs were shooting LA cops and cutting their cars to pieces. Until better equipped reinforcements were improvised or mustered, the cops couldn't land an effective hit with their service weapons. That's not to say an armed civilian might not get lucky in an exchange with a bad guy with superior firepower. Or at least buy some time to help others escape. That's what happened in Palm Bay, Florida in 1987 when a gunman with a Mini-14 began random shooting outside a supermarket. Responding cops fell to his gunfire, but an armed civilian managed to engage the gunman for a time. The civilian didn't score any hits, and in the initial aftermath he was criticized by police for getting involved. But it was later acknowledged, his actions probably slowed the attack, and gave others opportunity to escape. As for the Aurora situation, if concealed carry had been allowed in the theater, and someone there had a gun - he or she might have managed a lucky shot. Even if the shot didn't penetrate the attacker's body armor, it might have been enough to rattle his concentration and broken up the attack. The again, any intervening civilian might have become the recipient of the bad guy's next lethal round, and it might have come before the first defensive shot could be fired. Any kind of speculation is just that: Speculation. We don't know how it would have played because things didn't go down that way. Yes, conceal carry means if attacked, you have means at hand to defend yourself. But that's no guarantee you're going to prevail. Fight the fight, and advocate for conceal carry all you want. Just don't get caught up in touting a fantasy that conceal carry makes everyone a superhero. Anti-gun treaty proponents continue to mislead the public, claiming the treaty would have no impact on American gun owners. That's a bald-faced lie. For example, the most recent draft treaty includes import/export controls that would require officials in an importing country to collect information on the "end user" of a firearm, keep the information for 20 years, and provide the information to the country from which the gun was exported. In other words, if you bought a Beretta shotgun, you would be an "end user" and the U.S. government would have to keep a record of you and notify the Italian government about your purchase. That is gun registration. If the U.S. refuses to implement this data collection on law-abiding American gun owners, other nations might be required to ban the export of firearms to the U.S. There's other stuff about the treaty in the NRA-ILA alert that should give supporters of America's Second Amendment the heebie-geebies. I tend to see efforts to draft, sign and ratify this treaty as treachery in motion. And the fact the Obama administration is pursuing it now is among the signs that tip me off that this is not a normal election year. The left wants to dwell on the gun angle of Batman theater shooting in Colorado. They pretend guns are the most destructive devices out there. But those on the left ignore plenty of evidence to the contrary. For instance, they overlook the case of a self-described activist who apparently came close to blowing up a gas main and a good chunk of a suburban community near Dallas, Texas last month. Even if you could take away the guns, those bent on destruction would likely move on to other implements as they attempt to carry acts of violence. Firearms are generally targeted, point-to-point, one-victim-per-round systems. Most anarchists or terrorists have long known bombs and arson are much more efficient for mass destruction. By the way, is there any chance we'd have seen more in the media about the Texas case if the alleged perpetrator hadn't been described as anti-big business and linked to environmental activism? In a normal election year, an incumbent president would at least pretend to steer toward the center, trying to convince the voters he represents middle America and the country's core values. This year, President Obama has clearly staked a course to the left, pitching class envy and catering to progressive special interests. What could his motive be? Does he think the country has followed and has fallen in love with his fundamental transformation of America, and wants him to take it to the next level? Could he be intentionally trying to lose the election, knowing his policies and performance so far have set an irrevocable course for a crash early next year? Is it possible he and his team plan some super-secret extra-ordinary October (or thereabouts) surprise intended to herd the country back into his arms? Or is the answer simply found in the fact that his campaign and administration are both so dominated by far lefty group-think that they don't even realize how out of step they are on so many issues? While the reasons behind the Obama strategy remains unclear, I stand by my initial observation. This is not a normal election year. And I've gotta ask: Is the Romney campaign savvy enough to adapt to the odd circumstances? Or will it try to run the race as if conventional rules apply? Kentucky now touts U.S. 23 as the Country Music Highway. I wasn't impressed. Yes, plenty of country's superstars have grown up not far from the path of U.S. 23. People like Ricky Skaggs, Loretta Lynn and Patty Loveless. And signs direct you to points of country music interest along the highway's path. But Kentucky's U.S. 23 has been re-done and upgraded in recent years. And if you stick with the main highway, it's as bland and boring as most Interstates. We drove a good bit of the updated 23 this week. And missed a lot of the Appalachian character by doing so. Other states give you a choice of routing through by-passed towns by offering spurs with the same highway number with an Alternative or Business descriptor to set them apart. But that's not the case with Kentucky's U.S. 23. If you're looking to find Prestonsburg, you have to follow S.R. 1428. And compared to the kind of signage you'd see in other states, this business routes aren't well marked. You almost need an iPad opened to a map page to find some of these routes, the Kentucky official highway map lacks these details. Don't get me wrong. I understand the region needs a modern highway to connect it to the rest of the country. And today's U.S. 23 is top-notch as highways go. But I almost got the impression Kentucky's trying to hide some of its small towns. Yes, many of them are run down, and have pockets that might be considered eyesores. But poverty has long been part of Appalachia's legacy. And if you're going to understand the region and the country music artists who've come out of there, you should take the time to tour at least one or two of the bypassed communities if you're making your way down U.S. 23. It might be nice to see more done to highlight the Civil War history in the eastern Kentucky region now spanned by U.S. 23. 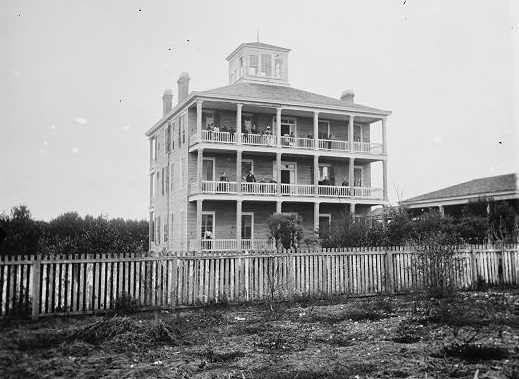 It was a part of country where the war truly was a brother-against-brother experience. 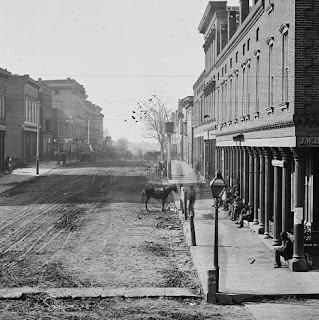 Many a clash or skirmish took place between northern and southern factions around places like Louisa, Catlettsburg, Pikeville. The president says he and the first lady are shocked and saddened by the mass shooting in Aurora, Colorado overnight. But the Obamas failed to take notice when their hometown of Chicago racked up a similar casualty count over the Memorial Day weekend. 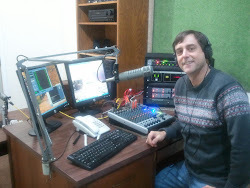 Don and Doug are back at 1:00 pm today (July 20) with another show. Doug's just back from a drivng tour through Appalachia. The Obama-Biden strategy of killing coal, and the communities that depend on it, appears to be working. Other things continue to unravel as well. Don's made a list of current events to keep us on track as we continue to connect the dots. Join us for conservative talk with viewpoints you won't hear anywhere else. I've been on the road since Sunday. North to Cincinnati for a day, and then my wife and I took the long and winding way home through Portsmouth, Ohio; Louisia and Pikeville, Kentucky... and then through a bunch of other little towns and crossroads working my way over to Knoxville, Tennessee. We made the final leg home today in part by taking U.S. 11 aka the Lee Highway. I'll share some thoughts about the trip on tomorrow's (July 20) Don and Doug program. I've largely been out of contact, so I'm not sure what Don's picked out for the program but whatever it is, but I suspect he's found some good stuff to bring to the show as well. Are leisurely summer breaks in peril? More than a few hints here that progressive central planners believe they need a greater say in how kids spend their summer vacations. This one strikes me as the largest: We're not going to grow our way out of the present economic mess. We're too busy growing the pit that's about to swallow us. Ex-OMB Director David Stockman is also out with new a new warning. And here's a bit of speculation regarding the next financial rescue steps. The only things it may accomplish is revealing how far we've fallen, and that all the Fed's ammo's been spent. The good news is, President Obama is becoming more transparent in his war on the private sector. And he's painted a big bullseye on small businesses. In Obama's mind, no one works for themselves. They work for him. And the collective. That's the casualty count in Chicago this weekend (as of early Sunday morning). Best I can tell, no one matching this description has been apprehended. As they used to say on Hill Street Blues, be careful out there. Sometimes tweets carry little thoughts. Other times, you can pack a lot of truth into 140 characters. 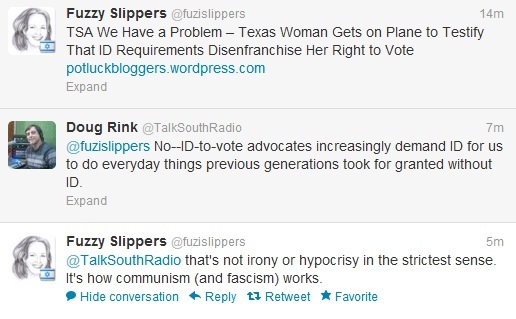 If you like Fuzzy Slipper's tweets, check out the blog where she shares larger doses of what she calls Fuzzy Logic. Media Matters for America is taking another swat at trying to discredit the congressional investigation of Operation Fast and Furious by taking more swats at Mike Vanderboegh, one of the two bloggers who broke the story over a year and a half ago. And let's get one thing straight, at least, since everyone here seems to think within the straight-jacket of party politics, this has nothing to do with that false dichotomy. I am not a member of the GOP, nor are most of my friends. I'm proud to say I've been on the enemies lists of the past three White Houses. Mostly that is because I'm a big believer in the antiseptic qualities of sunlight on government conduct. The ATF whistleblowers came to us in spite of our philosophical differences because they knew we shared that principle and that our past track record proved we couldn't be bullied off of it. It's really a shame those on the left either aren't smart enough or pretend to be be dumb enough not to see this point for themselves. Rather than analyze how the story broke and the ever mounting evidence, the left's apologists focus on protecting their ideological allies in the Obama administration by attacking the messengers who dared to stick their necks out to begin getting at the truth. The left's distraction hasn't worked so far, and will likely continue to fail going forward. Too many witnesses have come forward, too many documents disclosed. It's way too late to lend any credence to the Alinsky-like tactic of attacking the messengers. What Nigel Farage says he sees among EU leadership in Brussels sound a lot like how some of us see the Obama administration handling U.S. affairs. Ever do a Google Search for Obama and Cult? Mine returned 54 million, 600-thousand results. No quorum is specifically referenced in the key passage, no notice requiremetns. Just approval by two thirds of those present. Might this open the door to some kind of lame duck, late night, recess maneuver to ratify something like the Arms Trade Treaty now being negotiated at the U.N.? I'd like to know if any other treaties might have been ratified previously under such a maneuver? Even if it hasn't been done before, how might the current U.S. Supreme Court view such a move? Speculation on the answer may vary widely especially after the creative interpretation from the court that allowed the Obamacare individual mandate to stand. Our discussion of the arms treaty in general began about 38 minutes into the show, Don's pondering of the Constitution's working starts about 41 minutes in. The July 13th Don and Doug program is now available through the On Demand player at TalkSouthRadio.com. The Burning Platform has collected an awesome set of graphs and charts (Please pardon my using the word awesome to describe what are likely ugliest economic trends of our lifetimes). My riding mower died. The repair guy says ethanol ate the carburator's insides. This is the second mower I've had knocked out of action by ethanol in two years. I now put Sta-Bil in my mower gas, but I guess the damage had already been done on my seven year old rider. Progressives have long tried to present themselves as something they're not. Need an example? Itr's available from ProgressiveBumperStickers.com. But I've yet to see one stuck on a car's backside. I'd be one-up on Ben Bernanke. Check out this analysis at Of Two Minds. Now the CDC offers official advice on how to deal with the stress of planning a wedding. You’ve put in a lot of work leading up to this event, so the idea of a back-up emergency kit shouldn’t be too far-fetched. The bridal kit should include extra safety pins, makeup for touchups, maybe a few sedatives. It also wouldn’t hurt to have the essentials from a home emergency kit or “go-bag” by your side. You never know when you might need to bandage up a clumsy flower girl, revive a passed out reception guest, or even evacuate. Has the CDC strayed from its core mission? Do we really need to spend government money to produce a web page on the stress and material required to pull a wedding event together? Wedding planning is just one more aspect of our lives we can't handle on their own without government government guidance and intervention? Okay, I get it. 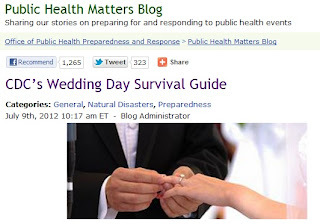 The CDC is trying to be cute while trying to trigger some kind of response to get Americans to grasp the most basic concepts of disaster preparedness. But by going to such degrees of silliness, do does it undermine the message it's trying to present? Do you like your Constitution firm or squishy? ...nearly half (49%) of Likely U.S. Voters believe the Constitution should be strictly interpreted as written, according to a new Rasmussen Reports national telephone survey. Forty-three percent (43%) disagree and say they are more inclined to view it as a “living document” subject to constant reinterpretation depending on the changing times. The gang menace is spreading into small cities and rural areas. Ir's actually been going on for a while. Is the spread picking up speed? Or has the problem just reached the threshold where more people are noticing, and local officials can no longer appear credible if they try to deny it's happening? A 2003 abstract focused on Hall County, Georgia. Hillbangers, a 2004 story in the New York Times. A 2007 article about gangs in Omega, Georgia. And here's the FBI's 2011 National Gang Threat Assessment. Scroll down to the appendix section (or do a find search) to get a list of gangs believed to be operating in your state. Massive manipulation (expansion) of the money supply is what keeps things looking normal right now. Does shooting video of a Republican candidate's home and then posting it online offer Democrats any political advantage? Whether is does nor not, Politico.com reports Dems are making no apology for the increasing extent to which they use the tactic. I wonder if Homeland Security is paying attention to the Dems' new obsession. Come to think of it, what Democrats are doing may also raise suspicions under points three, seven, and maybe eight. Has anyone put in a see something, say something call to Big Sis about all this suspicious activity? There's a bunch of folks who fear the United Nations Arms Trade Treaty now being crafted in New York could have chilling impact on our Second Amendment rights. And while language in the treaty may not go so far as banning private possession of arms, there appear to be some worrisome proposals regarding what should be put in the treaty. All efforts should be made to bring production and stockpiles in major producing States under international scrutiny, as international accountability was the only guarantee against abuse of the existing imbalance between major arms producers and the rest of the world. Arguing that position, the representative of the International Committee of the Red Cross said that ammunition were the fuel of weapons-related violence. To be truly effective, therefore, the treaty must apply the same criteria to ammunition transfers that it did to weapons transfers, she said, explaining that there were already massive numbers of weapons in circulation, but that their impact depended on a constant supply of ammunition. Similarly, Namibia’s representative said that since it was ammunition that made arms lethal, the treaty should be applicable to the full range of conventional arms and ammunition. The Obama administration has publicly put a list of conditions on signing the treaty that it says will protect the arms-bearing rights of Americans. And left leaning media are fond of painting conservatives as paranoid on treaty issues. But I'd argue, even if all these conditions are apparently met, do they really offer protections? We learned a lot from watching the drafting, passage, and then seeing the Supreme Court uphold Obamacare. We've seen what the Obama administration tells us and what it delivers can be complete opposites. We've also seen the Supreme Court is willing to go to great lengths to uphold the Constitutionality of a tax that was never written into law. We can only guess how the court might interpret something like the pending arms treaty it it were to be ratified. Despite assurances from the Obama administration, there appears to be plenty of potential for danger coming down the pike in this pending arms treaty. There's also potential the Obama administration might try to push through ratification under a lame duck senate late this year. That's exactly the strategy they used to get passage of the New START treaty just days before Christmas 2010. It's time to put your senator's on notice this Arms Trade Treaty is a bad idea. Urge them to vote no. What will NYC's nanny-state grab for next? Mayor Bloomberg's private police have swept across America digging dirt on gun sellers. He and NYC bureaucrats have worked to wipe out smoking, transfats and Big Gulps. What will they target next? Believe it or not, stand alone beds, formal sit-down dining and walk-in closets make the list. "NYC Asking Developers to Test Tiny Apartments"
Terms like running in circles and ponzi scheme appear in this CNBC segment featuring both Nigel Farage and Rick Santelli. What took CNBC so long to get Farage on? His now famous Titanic rant happened back on June 13. Georgia's Johnny Isakson is among those who appear missing in action as Republicans in the Senate formally align forces to push back Obama administration plans to sign and seek ratification of the United Nations' Law of the Sea Treaty (LOST). Peach Pundit reports Isakson is still planning a no vote. So why not link up with the organised opposition and your party's leadership, Johnny? Those seeking a stronger commitment from Isakson may have good reason. Isakson has broken with Republican opposition before. Isakson was among 11 Republicans who voted for the Obama administration's New START treaty with Russia in December 2010. David Codrea ponders yesterday's DOJ shift in strategy to apprehend Brian Terry murder suspects. But the mayor and his politically correct police superintendent insist their new crime fighting strategies are superior to those they replaced. Saw this at Second City Cop. It's just too funny. If you don't get it, click here for the necessary background. Second City Cop is a must read for a cop's eye view of what's going down in Chicago. And since Chicago is the president's hometown and Rahm's now the mayor, don't we all want to keep up on what's goin' down in Chicago? The Department of Justice now offers a million dollar reward for help in apprehending the suspected killers of Border Patrol agent Brian Terry. The murder happened 17 months ago. And it was only today at key information about the case and a big reward were sprung loose by the DOJ. The timing is curious. Cynical side of me wonders if Democrats did some internal polling, and found Attorney General Eric Holder took a big hit after having been recently been voted in contempt of Congress for failing to release documents on DOJ's Operation Fast and Furious. Guns tied to the operation were reportedly recovered at the Terry murder scene in Arizona back in 2010. Is the new strategy and reward primarily focused on finding the missing Terry suspects? Or is the new push just a damage control op to rescue the attorney general? And... yeah... it could be a little of both. Times are anything but normal. And as political powers keep kicking the can forward, it's clear to see that's more than a pothole in the road ahead. Bottom line: Too many games have been played for too long in attempts to distort economic realities and fool the people. But like Kunstler said, it can't go on forever: "Reality dislikes fraud and accounting tricks. Reality is serious about settling scores." What's unclear is how much time we have left. But based on the rising levels of absurdity in official rhetoric, coupled with diminishing returns for each new and bigger gimmick designed to stave off economic disaster, I'd say time's getting very short. Freshly canned stewed tomatoes packed with a pressure canner. The only thing better than having homegrown or farmer's market organic fruits and veggies is being able to can some to enjoy later when the growing season is long past. It's also fun rediscovering skills and technology that were largely taken for granted by past generations, but that have largely been forgotten by many of us today. Who's to blame for Chicago's violent crime problem where weekend homicides frequently outpace the wartime casualty counts out of Afghanistan? And you thought Obama was lame for trying to blame his economic policy failures on Bush? Is the con job starting? Are we spirited or spiritless this 4th of July?